AJBAS (Australian Journal of Basic and Applied Sciences) is a multidisciplinary journalthat publishes high quality research publications in the areas of Agriculture, Biological, Information, Health & Life Sciences, Zoology, Humanity, Social and Applied Sciences etc. and published by American-Eurasian Network for Scientific Information, Jordan with ISSN: 1991-8178. Being an academic-research publisher of peer-reviewed journals across the world, AJBAS is committed to publish excellent, original, double-blind peer-reviewed research articles of all types in various subjects. Along with AJBAS, AENSI Publishing Corporation publishes a number of journals to nurture the community and recognize the budding talents in the scientific world. Authors are advised to make use of this checklist before submitting your articles to AJBAS which will ensure fast processing and easy proceedings. Human research involves significant risks and AJBAS is careful about publishing research articles that involves Human research activities. Though the best care is taken during the research, there are instances that may create mishaps which leads to man-made disasters.For all the research submissions, authors must (if in case, vulnerable people such as pregnant women or children are involved) and get it approved by the Institutional Review Board of the respective institutions and/or their equivalent authorities and/or the government institutions. Authors must get informed consent from the human participants explaining the study’s objective and possible outcome. While submitting research articles for consideration, authors must declare that their study comply with the ethical considerations put forth by International forums and institutions. AJBAS and its group of journals do not hold any responsibility or undergo any kind of legal proceedings in case if the research publications invited any such activity. •	Your suggestion to AJBAS does not bind the Editor-in-Chief any way. Those who are suggested by authors may or may not be considered by the editor-in-chief to review your article. •	The potential reviewers should not have conflicts in terms of funding, research findings, discriminative or any such conflicts for that matter. Research papers that justify research questions and achieve the objectives through empirical information that represent a substantial advance in understanding an important problem and have immediate and far-reaching implications. A usual research paper does not exceed 2,500-3,000 words excluding references, tables, and legends to figures and structured usually (with few exceptions and to be used only as a reference and not as it is) as Introduction, Materials and Methods or Methodology, Literature review, Results or Statistical analysis, Discussion, Conclusion, Limitations and Recommendations. Other than the above, the text may have additional subheadings that should not affect the flow.Abstract, Reference, Bibliography are discussed under the author guidelines. Introduction: With adequate background about your research work, outline the issue being addressed and specify the objectives in a precise and yet informative manner. Too heavy statistical comparisons are suggested to be avoided. If you are developing your paper from your thesis/dissertation, do not use the chapterization as it is. Literature review: A brief literature review with important studies which you think that are most relevant to the theme is to be cited here. Avoid summarizing the articlesand keep it to the minimum. Materials or Methods/Methodology: Sufficient details should be provided here to aid the future researchers conduct research in this area. Some standard methods which are globally known/accepted can be mentioned in few words except if have not made any changes. Each raw material/design/method/source/component to be detailed as much as possible. Do not mention the usual practices done during investigation. Results or Statistical analysis: Results should be very concise and clear with informative tables. No repetitive tables, figures are allowed. Authors are required to limit the number of tables/figures to 5-7 in the entire article (the tables/figures will be calculated as ‘Single item’). Discussion: The section should explain how the current study results are unique and comparatively better/naive than the previous studies. No repetition of results in the discussion section. Discussion should be comprehensive, precise and show theimprovements. Do not cite lot of studies and avoid discussing published literature. Conclusion: Present a short form of the study in the conclusion which should not be repetitive of discussion. This may either be a standalone section or combined as Discussion and conclusion Limitations and Recommendations: Based on the findings and limitations, authors need to list out the recommendations to the future researchers. The limitations should be, not confined to, methodological aspects and not based on personal experiences of the author(s) while conducting the research. Review articles are written to summarize the current/ongoing and the literature studies of a particular topic pertaining to the research interests which would not usually contain the new facts or analysed results. Review articles should be between 2,500-3,500 words that encompass the information about the current investigations, government policies and international environment about the specific topic.Reviews can be of any type such as systematic review, clinical reviews (for which the format would be different). General review format should contain, but not limited to, Introduction, Methodology, Foundation, Synthesis with Concepts, Analysis of the studies, General critique followed by conclusion. The Appendices and Bibliography are to be listed as per the author guidelines. Short communications are nothing but concise, independent report to represent a significant contribution with not more than 2500 words and must be a completed work since it is considered as an alternative format to describe smaller pieces of work rather than preliminary findings. Letters are written in the form of short reports focusing an important finding of a research article that kindles the interest among the audience outside the relevant subject. Though letters are not original reports of its own kind, it still provide new insights through putting the main findings into general context. The letters are written with tables and figures within 1,000 words (excluding references, tables, figures). Usually the letters end with the discussion that should be as succinct as possible and ensure not to repeat the summary/introduction material and only convey the general relevance in a brief manner. Current Opinion articles or opinion articles are usually developed by the authors in a systematic, and integrative manner which provides unique updates on the expanding theme areas based on their personal views which invites healthy debates on a particular research-related topic. Being an updated topic, the opinions and evaluations on most interesting articles in a specific theme/area is published in this which acts as a valuable resource to researchers across the globe. The authors are recommended to do an in-depth analysis before submitting an opinion article since mere outlining an issue will not be considered for publication in AJBAS. Opinion articles should be developed between 1500 and 2500 words and may contain subtopics such as, but not limited to, Introduction, opinion structure with subtitles, conclusion, and message to readers followed by questions. You can submit a book review which should be between 600-1000 words. The information such as book title, author(s) name, date, publishers, ISSN, number of pages, Cost and a small write-up about you on how you are justifying that you are qualified to review the book. You can choose a newly published book or a book considered for publication. Since it is not a report on book, do not provide sub-topics, instead brief the contentand then highlight the strengths and weaknesses of the book. Conceptual articles are describedas articles which shed insights on new theoretical perspectives or integrate existing theoretical views in order to address the innovative, new or adaptedprocedures or techniques. With the conceptual articles discussing about the current professional issues or professional development, they are otherwise well-reasoned reactions or responses to previously published articles. Though there is no specific word count requirement, you are required to limit the same within 1500 words. A technical note is an article giving a brief description of a technique or procedure. The technique, procedureor device described should have practical value and coupled with great importance to the society. Technical reports are usually not referenced and between 3-4 pages (750-1000 words) in nature. Authors need to ensure that their journal articles comply with the ‘Universal accessibility’ of the content so that differently-abled persons can access the content. In order to give people of all abilities and disabilities access the content, especially figures please make sure thatyou provide descriptive captions to all figures and use patterns instead of different colors to convey the difference/similarity. Authors are requested to ensure that the submitted manuscript comply with the submission guidelines and if found mismatching the same may be sent to authors for re-submission. The authors are required to make use of the template and follow the sequence given hereby. Though some of the elements may or may not applicable in your study, this is a common template which can be used based on the article type. Structured abstract(Introduction, Methods, Results and conclusion) with word count between 300 to 500 words and no sub-headings are allowed in this structured abstract. Authors should avoid the use of personal pronouns. Authors are advised to provide appropriate and short keywords so that your submissions are user-friendly and visible to the maximum audience. A list of 4-7 keywords per article is suggested which should not exceed 8. Do not use language-specific keyword. Author(s) names should be written in full with their designation and affiliation and country (ies). In case of more than one author, the name of the corresponding author should be marked with an asterisk (*) for identification purpose. The corresponding author’s Name, e-mail address, telephone and fax numbers should be provided clearly for communication. Times new roman, 10 pt with no columns. The main headings should be numbered. Authors are advised to use the table function, not spreadsheets, to make tables. All Figures which may be of any type such as charts, diagrams, line drawings, web pages/screenshots and photographic images should be submitted ONLY in electronic form, not as hard copy. Figures and Graphs should’ve been drawn clearly with captions. In case of multiple images combined together, the relevant markings should be given in order to ensure that the images are identified easily. AJBAS accepts TIFF or JPEG files for which the file size should not be more than 3 MB.For figures, the preferred resolution should be 300 dpi (color), 500 dpi (Black and White) and 1,000 dpi for line-art figure at the desired print size.Images less than this resolution will not be accepted for publications. Authors are requested to ensure footnotes are used whenever it cannot be avoided and most necessarily to be used. Footnotes are not to be listed again the reference list. Authors are encouraged to acknowledge under a separate section prior to references. Kindly do not add this information in title page/footnotes. Please list the individuals who contributed to the research in language help or proofreading etc. The size of the author photograph must be 1.14" and0.95". The author’s full name with a brief biodata on his/her credibility, research and professional experience, research interests, memberships, awards and grants/funds received in his/her name. All the references are to be cited both in-text as well as in a separate list. The list of references should be arranged alphabetically after the acknowledgements. Kindly note that the number ofreferences should be 1 reference per 100-150 words. 1 Journal Article – Single author Perry (2003) early proved that ... This is in agreement with the results obtained by several authors (Brown, 1999; Kramer, 2004; Smith, 2008) Perry, D., 2005. Assessment of methodology with specific reference to case study. Journal of American Science, 1(2): 14-21. 2 Journal Article – Two authors Zhang and Cheng (2001) reported that... This was later found to be incorrect (Kumar and Ahmed, 2000) Zhang, D., and J.Cheng., 2005. Assessing Sediment Loading from Agricultural Croplands in the Great Lakes Basin. Journal of American Science, 1(2): 14-21. AJBAS accepts supplementary materials only in case of special requirements. These special materials may be animation movies, audio/video recordings, spreadsheets, PDF files,.pdb (chemical), .wrl (VRML), .nb (Mathematica notebook),.tex and .zip or .gz file. These supplementary materials whether need to be uploaded or accepted is at the sole discretion of the Editor-in-Chief. Proofs will be sent to the corresponding author through e-mail once the submission is accepted.Your response with counter-comments or acceptance with or without corrections should be sent to us within 24 hours upon the receipt of our email. After this timeline, the author will be notified by the Editor-in-Chief whether the article will be considered for next issue in AJBAS. In spite of two reminders, if the corresponding author does not reply, the article will be archived and no further communications from the corresponding author regarding the submitted article will be entertained. AJBAS receives manuscripts and check the content and style of the publications for meeting the author guidelines. However the copyeditor will not be contributing/altering the paper for language during which the authors can avail our Professional editing services for ‘Native English Language Editing and proofreading’. AJBAS offers ‘Editing, Proofreading’ services based on request in order to ensure that the language barriers are cleared to publish a research work of high standards. Authors are requested to note that the service provided by AJBAS is purely an optional, not a mandatory one. Further, if this service do not include ‘writing, contributing, analyzing’ of any type. Availing this add-on service by AJBAS doesn’t quality your manuscript automatically since it is at the sole discretion of Editor-in-Chief based on the quality of the research. AUSTRALIAN JOURNAL OF BASIC AND APPLIED SCIENCES (AJBAS) does not have any income from selling subscriptions to the print or online version of this journal or from pay-per-view fees. 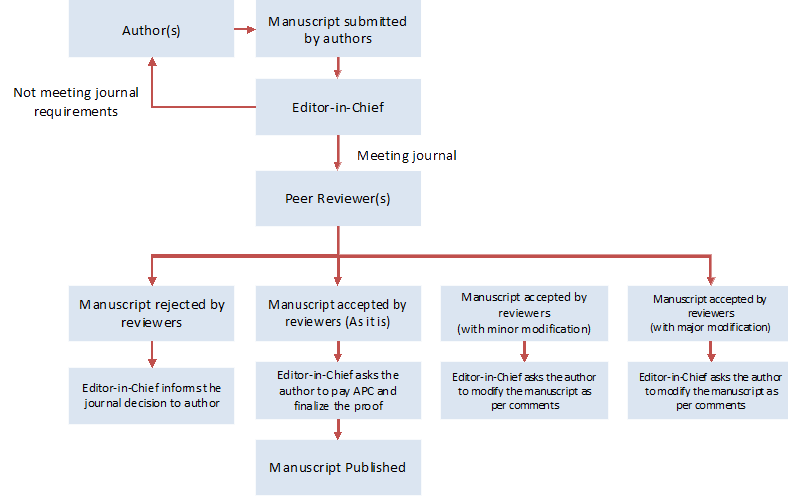 In order to cover the costs of providing and maintaining a publication infrastructure, managing the journals, and processing the manuscripts through peer-review and the editorial procedure, the journal uses a form of conditional submission fee referred to as Article Processing Charge (APC). The Article Processing Charges (APC) according to country. For Fast publication option please contact the editor. Rapid publication: Manuscripts are peer-reviewed and a first decision provided to authors approximately 7-15 days after submission; acceptance to publication is undertaken in 12 days (median values for papers published in this journal. Manuscript needs to be completely re-checked by consulting with and English native or speaker. Although AUSTRALIAN JOURNAL OF BASIC AND APPLIED SCIENCES does not recommend this option, but authors necessarily need to improve their manuscript. Alternatively, AJBAS has an English language edition facility but there is a fee of 150 USD for the service and does by the Native editor and this optional for the authors. (Optional). Article Processing Charges (APC) for hard copy 100 USD.